The elementary returnee class has been working on an interesting project all summer. First they chose a biography of their favorite person in history from the "Who Was?" series. After reading the book, taking notes, and reporting each week to the class what they learned, it was time to make materials for a presentation. One of my students read about Abraham Lincoln and decided to present about his life from a first person perspective. She drew pictures of Abraham Lincoln with speech bubbles coming out of his mouth, telling his life story. 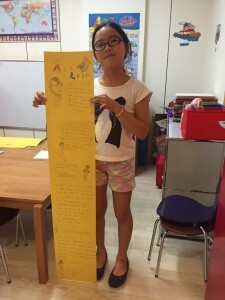 Some students made posters or "kami-shibai" types of presentation materials, but she decided to tape the papers together in one long strip. She held it up and exclaimed in surprise, "Look, Miss Lesley! My presentation is as tall as me!" The students will give these presentations at the end of the month when their parents come to observe the class. I'm proud of how hard they have worked and can't wait to see their presentations!